Welcome to VMedia – one of Canada’s most popular and progressive Multimedia Providers offering the most modern and superior High Speed Internet, IPTV and phone services – with extraordinary choices, flexibility, superb low prices – and now introducing their brand new wireless monitored Home Security System called VMedia Protect giving supreme protection to your home 24/7 guaranteeing peace of mind every day while you leave home. VMedia are excited to operate in the beautiful province of Ontario ( VMedia was founded in 2013 in Toronto!) and the city of Sault St Marie located on the banks of the magnificent St Mary’s River on Lake Superior amidst breathtaking unspoilt scenery with it’s famous Sault St Marie Canal and Sault Locks and beautiful ornate architecture with historical buildings and sites like the Ermatinger Clerque Historic Site, Bushplane Heritage centre, The superb Museum Ship Norgoma, Sault Ste Marie Museum showcasing the area’s long and interesting history from the First Nations to the present day – as well as a thriving arts and cultural hub – with many galleries including The Art Gallery of Algoma, Berkana Art Studio supporting and showcasing the vibrant and diverse local arts scene in a city with so much to do and see – hotels, restaurants, shops, markets, breweries and a multitude of outdoor activities like water – sports, sailing , fishing, hiking , parks , trails and so much more . Sault Ste Marie continues to enjoy the benefits of home entertainment, communication from VMedia and their new home security system called VMedia Protect – at really affordable prices and flexible choices to suit every household and budget. VMedia prides itself with its awesome customer care and seven-day technical support – putting our customers first always! The Internet continues to play a hugely prominent and important role every day across Canada and all over the world as it carries an extensive and endless amount of information, entertainment, education and communication that enables us to work and play 24 hours a day. Millions of Canadians are connected to VMedia’s High-Speed Internet enjoying a truly reliable service with fast speeds, no limits, no contracts and a superb variety of great Internet Plans and Internet Deals to suit every budget. VMedia are excited to offer our customers in Sault Ste Marie and the surrounding communities the best and most cost-effective internet at the lowest prices! VMedia only employs the best Technical Staff who continue to improve and upgrade the network ensuring you stay connected every day. VMedia offer great choices in Ontario and the Sault Ste Marie area with Cable, DSL or FTTN options and our friendly Sales Team will advise and assess what is suitable for your location and needs then offer you the lowest price – guaranteed! Click here for all Internet plans and prices – cheap internet guaranteed from VMedia! In recent years Television viewing has changed dramatically all over the world due to advances in Technology and innovation including the creation of IPTV using the mighty internet to stream TV entertainment and so much more directly into your home in an instant! In Canada IPTV or Internet Protocol Television is fast replacing the more traditional Satellite and Cable TV with it’s superior technology, crystal clear and sharp sound, and vision, cool features and with endless viewing choices – VMedia offer their highly popular IPTV service in the city of Sault Ste Marie and surrounding communities at prices that are simply unbeatable! 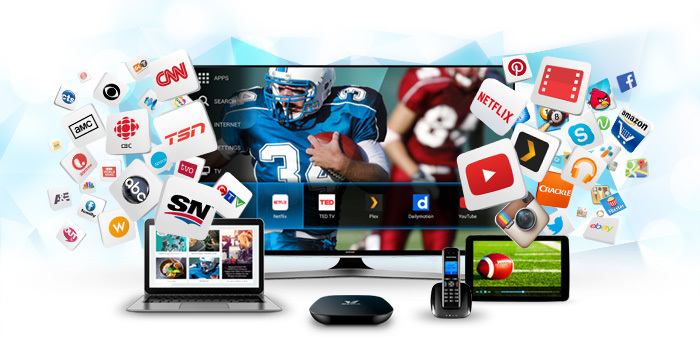 VMedia IPTV is streamed directly to your home via the internet through an IPTV box called The VBox offering instant access to all the best and latest Canadian, US and international networks and channels, news, sport, music, kids, films, games and much more! The VBox includes a browser allowing instant access to the Web, Facebook, Twitter, Skype, YouTube, Netflix, Plex, XBMC, Instagram, Picasa and 100’s of apps bringing hours of entertainment and fun for all ages. VCloud and PVR are part of the many functions of the VBox allowing recording and a seven-day “scroll back” option so you never miss your favorite programmes and PVR to pause, rewind, stop or fast forward recorded programmes bringing even more flexibility and enjoyment – only from VMedia! The value and choice continue from VMedia with our amazing Packages and Theme Packs on offer starting with our most popular Package called TheSkinny – offering 23 channels for only $24.95/month – outstanding value! Other Packages include The Basic – offering 45 channels for only $35.95/month and The new Premium Flex – offering huge choices with 4 options, Premium Classic, Premium Family, Premium Sports, and Premium Lifestyle for only $49.95/month and currently with 2 months free and The Grand Premium offering 100 channels for only $67.95/month! Our Theme Packs will unlock another world of supreme viewing choices for all ages and interests including TVO HD, CTV HD, YES TV , TFO, Family Pack, Kids Pack, Hollywood Suite, Sports Man, Sports Combo, International, TSN, Disney Pack, Entertainment, Style, Living, Discovery, History and many more! Click here for all available channels, Packages, and Theme Packs. Unmissable entertainment and more – with VMedia IPTV! VMedia recently launched their new and wireless home Security system called VMedia Protect and are offering it to our new customers in Sault Ste Marie to enhance home security and giving the ultimate peace of mind 24/7. VMedia offer it’s a most innovative security system that is so easy to install will provide an effective home security monitoring service from our Central Monitoring Station – all at affordable prices and with a 30-day money back guarantee and no contracts! Our 5 diamond and ULC approved (the highest certification in the industry) Central Monitoring Station is staffed with our highly trained and professional operators 24/7, 365 days a year and if the alarm is activated at your home, a signal is sent over the internet or cellular connection to our Central Monitoring Station, where our operators will immediately notify you and dispatch the local police to your home. VMedia also provide a free app so you can arm and disarm your system and receive alerts and notifications from your phone or tablet – keeping your home safe and secure – all at your finger-tips! The Security Hub is the main control panel for your home security system and is so easy to install – all that is required is an internet connection. The sensors and PIR motion sensor will automatically connect to the Hub via RF enabling instant Central Monitoring Station reporting (GSM upgrades also available). The Hub contains a built-in battery for power outages. When installed simply plug in the Hub, attach the sensors here required and call us to activate – simple as that! When your VMedia Protect Kit is installed you are now ready for Home monitoring to complete your home protection – VMedia Protect offers 2 great Plans called Protect and Protect Plus. Protect offers 24/7 complete professional monitoring of your property 365 days a year with instant communication via the Internet with text, email and push notifications. We can also remotely arm/disarm your Security Hub if required. Protect Plus offers the same 24/7 complete professional monitoring of your property 365 days a year but with dual communication via the internet and cellular. We can also remotely arm /disarm your Security Hub if required. Protect Plus costs only $16.95/month. VMedia offer an optional add on service called Private Security Response offering complete peace of mind when you work or play. If your alarm is triggered VMedia will send a Private Security Response Team Member to check your home for to check for signs of a break – in and if one is detected they will inform you and the local police immediately. The Private Security Response service will save on costly call out false alarm charges which can range from $75 to $150! Cost of Private Security Response is only $4.95/month! VMedia Home Security System is for your home and can be customized to suit any house size or area so additional door and motion sensors may be required. A Pin Pad is also available and can be placed at entry points to your home to arm and disarm the system by entering your own secret security code. A Key Fob is also available for disarming your Security Hub without the need for a smartphone. VMedia can also upgrade your alarm with a built-in cellular chip, ideal for anyone needing secondary protection and also for rural homes without internet. We also provide extra window decals if required. Click here to see all the accessories and prices. Contact our Sales Team for further information and prices. VMedia Protect – in safe hands 24/7. Home Phone gives you low monthly bills, no contracts, 15 superb Phone features and the first month free. Canada Plan gives you unlimited calling all over Canada and reduced calls elsewhere for only $19.95/month. World Plan gives you unlimited calling to over 60 countries worldwide and reduced calls elsewhere for only $26.95/month. Click here for all Phone Plans, Phone features, call rates and all prices. The beautiful and energetic city of Sault Ste Marie and the surrounding communities continue to enjoy the benefits of a modern and truly reliable Multimedia Company offering the best High-Speed Internet, IPTV, and Phone and with our new Home Security System as VMedia always put our customers first. As we only employ the best staff you will receive awesome customer care so why not call our Sales Team today at 1 – 855 – 333 – 8269 or visit www.vmedia.ca for further information, all current deals, bundles and current special offers, including our new wireless security system called VMedia Protect and all prices. VMedia – keeping you connected, entertained and safe in your home – always!